Talking about Monsanto’s latest attempt to obstruct justice, halt transparency, and prevent people from stopping their seed and herbicide businesses from spreading is starting to seem redundant, but the company just keeps acting in increasingly objectionable ways. Now, the company is refusing to release to the public lab tests conducted in St. Louis, Missouri, which gave them authority to use glyphosate in China. Just months ago, Chinese food safety volunteers tendered a request to China’s Ministry of Agriculture to release the study that justified issuing the safety certificate for the import into China of Monsanto’s glyphosate-based herbicide RoundUp. Glyphosate was given a safety certificate in 1988 after studies submitted by Monsanto were conducted at Younger Laboratories in St. Louis Missouri. The study results have never been disclosed anywhere in the world, and Monsanto refuses to disclose the results now. If there truly were no adverse effects from rabbits and rats being exposed to glyphosate, then why not absolve themselves from public scrutiny, and post them for all to see? I think we know the answer to that question. If animals simply feeding on glyphosate-resistant GMO corn, soy, and other crops developed tumors, then what would have happened to rats who ate the stuff straight from droppers? Furthermore, why would China give Monsanto permission to export RoundUp into their country based on toxicity tests that only lasted a few days? 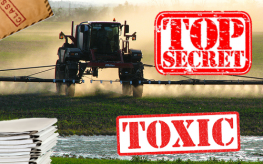 Meanwhile, additional toxicity tests conducted on glyphosate – the main ingredient in RoundUp – have been conducted in Europe, and by the Brussels-based advisor to NGOs on toxicity and risk assessment issues, Tony Tweedale has asked the European Food Safety Authority (EFSA) to disclose two more of these studies to the general public. One was a test by German regulatory agencies in which they measured an ‘Acceptable Daily Intake’ (ADI) of the chemical, and another measured chronic toxicity based on exposure. Germany had recommended revising the ADI upwards from 0.3 mg to 0.5 mg per kg of body weight per day, but we still aren’t certain there is any safe level of glyphosate exposure, since the toxin bioaccumulates in the body and also interacts with other pesticides and herbicides to cause severe health problems. Even the EPA admits this can be a problem. As DDT, for example, moves through the food chain, we are exposed to ever-increasing levels of the poison, and this goes for other pesticides, fungicides, and herbicides used in agriculture too. These substances aren’t just in the GMO plants we eat, but also in secondary consumers like livestock, fish, and birds. Despite Tweedale’s requests, the European Food Safety Authority has also refused to release their toxicity studies on Monsanto’s RoundUp, stating that they contain commercially confidential information. It seems our government agencies around the world will do nothing but continue to protect the world’s most hated corporation, while hiding the true toxicity levels of their best selling product from the people. The safety of any product and its wide dissemination to the members of the public must always take precedence over intellectual property rights. I don’t give a damned if they lose profits. The patent laws are supposed to protect their intellectual property and also their products from copyright theft. Even if the information is commercially sensitive it should be released as a matter of public concern and interest regardless of the excuses and obfuscating from the corporations and their political and government back room friends. There can be no excuse for hiding the truth and if it turns out that there is something that has been hidden from us that has allowed the continued use of these toxins at the expense of human life, human suffering and environmental degradation then those guilty of hiding these truths should face the most severe punishment allowed be they corporate, political or anyone else involved. This binding leads to inhibition of the enzyme and shuts down the entire pathway. Eventually this results in plant death from lack of aromatic amino acids used to make pigments and flavonoids the plant requires to survive. Glyphosate does not inhibit aromatic acid synthesis in animals and humans as they lack the shikimate pathway and aromatic amino acids are obtained from their diet. However, —beneficial gut bacteria isolated from chickens was found to be affected through inhibition at 0.075-0.15 ppm of glyphosate while pathogenic bacteria were more resistant. The only solution is to go door-to-door to educate consumers as to the effects of GMO. Let the lack of sales allow the garbage to back up on the shelves and warehouses. Since money talks, the store owners will stop buying it due to decreased profits. Fortunately, we are now seeing more organic foods advertised in the weekly flyers from larger chain grocery stores in comparison to the corporate GMO junk which are now placed in the back section of the flyers, so it is very evident that these companies are FINALLY recognizing the HIGH demand for NORMAL healthy foods. Unfortunately, the GMO junk is now ending up at the dollar type stores that end up feeding families who are on low budgets which will eventually ruin their health. The GMO junk is cost effective for the dollar stores since many these products can sit on the shelves for several years. Never waste money on any ‘so-called’ foods that come in a box or can. And that’s a bad thing how? Generally the poorer end of society are the most useless and a burden on the rest of society. If it wasn’t for overpopulation problems we wouldn’t have had to start using GMO food. I think you have a seriously confused idea as to what the real issues are here. GMOs are the result of some smart business executive who thought it would be a great idea to make agriculture a bit more profitable by increasing the use of glyphosate and other toxic herbicides by using the new science of Genetic Engineering. Even though it wasn’t proven to be safe and never has the individuals and their boards of corporate directors have endeavoured to manipulate every politician with sticky fingers to provide them with a cast iron alibi regarding safety. They have even made it impossible for anyone to see the proof of all their claims. Now to the other bit of your posting. The issue of population increase is a totally separate issue altogether. There is no correlation between the two issues. The use of GMO crops does not increase productivity. It only increases profits for the provider of the GMO seed and associated chemicals. As for wishing to see the demise of these ‘poorer’ people as if they are a bane on our planet is a long way below the belt! You are really treading into dangerous territory here. I suggest you retract your statement on this point immediately. Well also, even if his horrible statement about the “poorer end of society” was true, and not a stereotype. These posions don’t kill quickly, they kill gradually. Assuming based on this stereotype, they are also on state insurance, then they become sicker and less able to work, and more profitable to Big Pharma, which gets funded via this state insurance, which is in turn funded by taxpayers. Clearly good health in all segments of society is the path to a healthy, functioning country overall. How would it be if a worker lost his job due to these jobs being sent overseas (as I’ve seen happen, particularly in the Rust Belt Midwest) As a result, his family had to live off dollar store/cheap food for a while to survive? Then when the next job comes along, he’s sick, family’s having health problems, doesn’t know why — they assume it’s stress. Doctor visits don’t help; they make him sicker with their medicine…. and now he can’t hold down a job, or preform as well on the job because he has essentially been poisoned by “cheap food,” and modern medicine. Punishment for being low income… make you sick to guarantee that you stay poor?